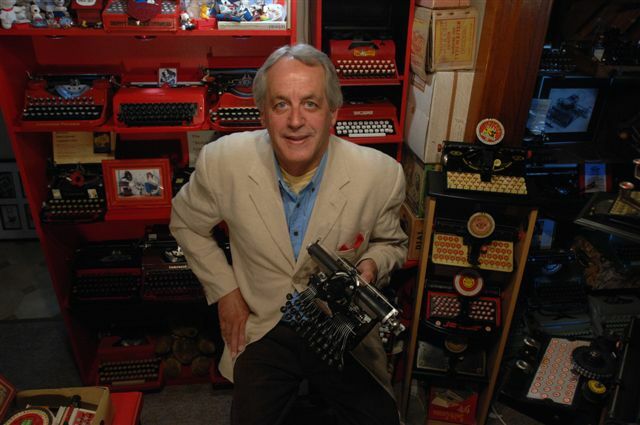 Most will know by now that the Northern Arizona University’s College of Social and Behavioral Sciences in Flagstaff, Arizona, has notified typewriter collectors of auctions for 28 typewriters. Sadly, I can’t show images of any of the machines up for auction as the website won’t allow me – seems pretty silly when they’re trying to promote these auctions! The auctions end in the next few days, although it would appear that at least some are “open-ended”. Not sure how that works!? Most interest at the moment is being shown in a Williams, a Chicago, a Hammond and a Blickensderfer. The university says, “We have recently reassessed object collections at the university and determined that the typewriters … are no longer relevant to the university’s mission.” Typewriters range from the 1880s to the 1950s. To view the typewriters, type “antique typewriter” in the search box. They start at 707512 and end at 707539. The direct path is here. 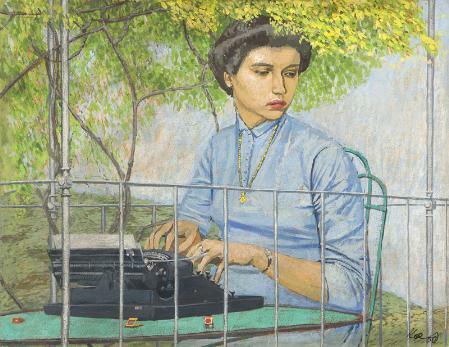 I love that painting, although it's odd -- she looks like she's in a cage. Yes, it does. I think there's a certain symbolism going on here, with the tiny trinkets around the typewriter. Are you in the bidding? I apologise for the inappropriate image, but I couldn't get any of the items being auctioned. Thanks for the heads up. Conveniently, I have a niece who is finishing up her Masters at NAU. Typewriter Furniture: Oh, Wouldn't It Be Luverly? Saga of the Rexina Typewriter: I Lose!